Buena Vista Street has taken on a decidedly spooky flavor during Halloween Time, and it is marked by a sweeping purple hue throughout most of the land. This is most especially strong around Carthay Circle, where the purple twinkle lights in the trees around the fountain cast an overwhelming gradient on pretty much everything. In the background, bats flying out of the "belfry" of Carthay Circle Restaurant accent the spooky scene. It's a wonderful aesthetic, and a great addition to the park. I love how it completely transforms the vibe for the autumn holiday season, and I really appreciate how DCA has finally been included into the Halloween festivities of the Disneyland Resort! 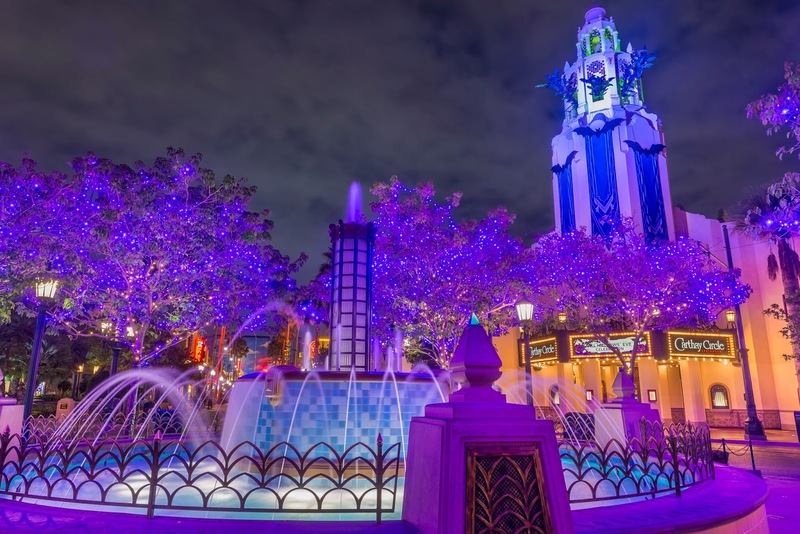 The Carthay Circle Fountain, like much of Buena Vista Street, is bathed in purple during Halloween Time!